Track 1, 2, 4, 5 and 7 recorded live at Casa Del Popolo in Montreal on September 24, 2012. Track 3, 6, 8 and 9 recorded live at Résonance in Montreal on August 8, 2013. 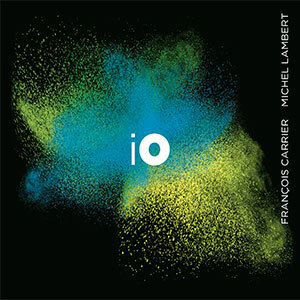 Michel Lambert and François Carrier joined in 1998 when they invited giant improviser and avant-gardist Dewey Redman. As a duet – drums and alto sax – they released 4 albums including the amazing “Kathmandu” session recorded in Nepal in 2006. Kathmandu was out on British label FMR Records one year later and got world wide outstanding reviews. It’s almost unthinkable to imagine that a saxophonist and a drummer can achieve to play a symphony by themselves and furthermore by improvising it??? The level of connection between Michel and François is just stunning! “io” relies on each other ability to be in the moment, in sync with the universe. Nothing premeditated. Just playing.